I've been a bit slow to start thinking about Christmas this year. I haven't spent my usual time looking at recipes thinking about what to make, I've only just started to buy Christmas presents. But I'm going to get the decorations out tonight so that I can check the lights before we buy our tree this weekend. I've made the cake and it's well wrapped up waiting for its second feed and, I can't promise more than this, but there is one gift guide and some news. 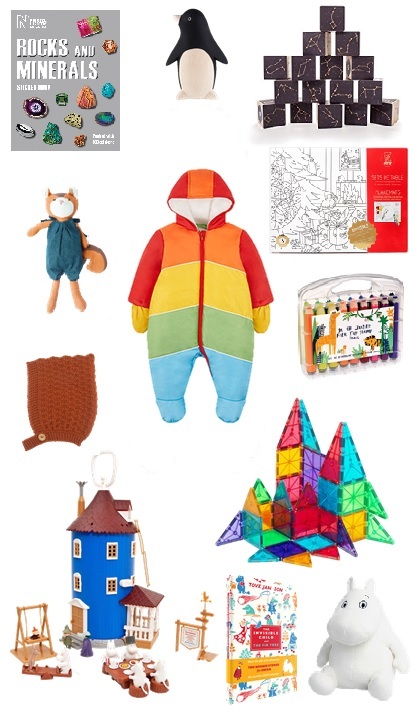 Clockwise from top left: stickers for a niece who loves rocks and minerals, a wooden penguin, constellation blocks for kids of all ages, placemats and stamp pens for Christmas Day colouring, clear Magna-Tiles for little builders, a Moomin toy, book and, most importantly, house, a handknitted hat and a toy cat for a baby, and, finally, a cosy rainbow suit for Winter walks. It's been over a year since I stopped working on Fridays. It was a choice that I thought about for a while, a choice that I know I'm lucky to have been able to make, and a choice that has turned out to be one of the best I've ever made about work. There are the Fridays when I stay in bed late, catch up on TV, only leaving the house to pop to the supermarket. And then there are the Fridays when I go out in the morning to a yoga class or for a swim, do some sewing, clean the flat, make bread, fill my day with things that make me feel productive. But most, like today, are somewhere in between. 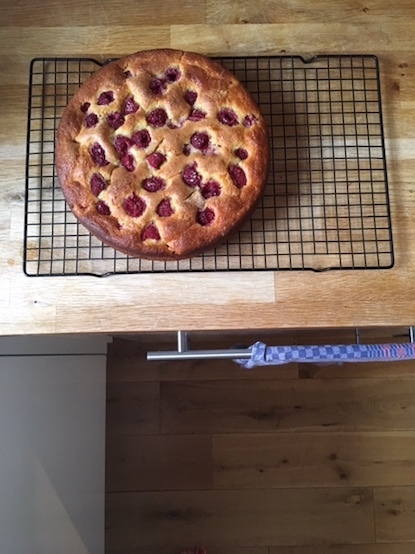 Today I popped out in the morning, had a long chat to my Mum once I was back in the flat, went to the supermarket, came home and baked a raspberry yoghurt cake. And now, now the cake is cooling, I'm waiting for Chris to get home, and there's pizza dough resting in a bowl because, as it turns out, there is almost always pizza dough on a Friday. I make a half batch of the recipe from Jamie's Italy that I've been faithful to for years and then freeze half of the dough for the following week. I used to form two roundish pizzas on baking parchment, pulling the whole thing onto an oven shelf. Now I make a single, roughly baking tray sized, one. The tray goes into the oven as it heats up, the pizza is shaped on parchment, then the whole thing pulled onto the tray while I try to avoid my hand brushing the scorchingly hot metal. It works well, sometimes even better with the frozen dough, and is just the right amount of pizza for two. I turn 38 tomorrow. 37 has been an up and down kind of a year and I'm trying to give up attempting to predict what the year to come might bring but there are a few things I would like to do. We went to Italy last month. It was hot, too hot really, in Rome. We saw sights but we also sought out shade, and gelato, at every opportunity. I hadn't realised how many water fountains there are in Rome but being able to fill bottles with cold drinking water whenever we needed to was a lifesaver. We stayed in Testaccio for 3 nights and spent a little time each day sitting on a bench under the trees watching people stop off at the water fountain to top up bottles, splash their faces, wash their hands. On the Saturday we went to a bakery and bought slices of freshly made pizza bianca, the guy behind the counter slicing the whole pizza in half down its length, gesturing to see how much we wanted, before chopping it into chunks. We ate it on a bench opposite the fountain before heading to the market to buy peaches and cherries. Later that day, after a visit to the Sistine Chapel and St Peter's Basilica, we walked along the river to Trastevere. We had walked past Da Enzo the day before, recognised it from a friend's photo on Instagram, and decided that we would try to go. After a couple of drinks that evening we stopped by and left our name and then waited, and waited. Later, I'm choosing not to dwell on how much later because it really was worth it, we sat down and ordered carbonara, cacio e pepe, and wild chicory. But, and this would be a recurring theme, after eating about a third of what was absolutely the best carbonara I have ever had my appetite vanished. Apparently my body doesn't do well with feeling too hot and trying to eat much of anything at all which is a very sad place to be when you're in Rome. So, a few days later when we left Rome and headed for the coast we decided that when we return, because we absolutely will, maybe it will be in Autumn, or very early Spring. But the other thing I decided was that I really need to learn to make a proper carbonara. So making carbonara is on my, not very long, list of things that I want to happen when I'm 38 list; as is conquering my hatred of creating foot rings in pottery. And, and I know I always say this but I'm hoping one day it will stick, I want to write more. Somehow writing a a few lines, here, or in a notebook, or on even on my phone, makes me feel like I have accomplished something even if those lines exist only in that place, in an imperfect form. Maybe it's a lesson I'm learning from pottery where I've been remarkably, for me, happy about my wonky pots, my imperfect glazing. Maybe the doing really is the thing. I keep meaning to write, just for a change, and then here we are about to go off on holiday. The only time I have been to Italy I was, I think, 23. Sarah and I spent a weekend in Milan, we stayed in a hotel that was cheap and surprisingly fancy, climbed up to the roof of the Duomo, and hid behind a rack of postcards to escape some rather persistent Italian boys. We were away last week. South for my sister's 40th birthday party, a few days in London, then five nights in Copenhagen. But that isn't what I'm writing about today. Our flight was delayed coming back on Sunday night and we were in a taxi sometime around 11pm when Drake's 'One Dance' came on the radio with its sample of 'Do You Mind'. We were living in a 5th floor flat, our second London flat after the one with the oddly shaped rooms and the small windows. This flat had five flights of stairs to walk up and there was a strange, slightly sweet, smell that we never managed to identify near the front door. It had a tiny kitchen and two uncomfortable blue sofas. But those five flights of stairs meant it was light, so light it bleached the spines of our books, and it had a balcony, that I once described as functional, that was just the right size for two. Quite often though it was just me. Chris was working in retail at the time which meant him getting home later than me in the evenings and working at least one day every weekend. On a nice day I would sit with a book, my feet propped up on the railings, popping in and out for cold drinks. I would look at the view and listen to the sounds floating up from the street. That summer the sounds that made me happiest were the songs that seemed to be everywhere in London at the time. A time when we would tune into pirate radio stations, the soundtrack almost inevitably something bouncy, the DJs would talk over it, rewind it, play it again. We would listen to 'Heads, Shoulders, Knees N Toes', 'In the Morning', 'Do You Mind', songs that made me smile, still make me smile, we would dance to them in our tiny kitchen. So, now, hearing one song play in a taxi in Edinburgh I think of another one that played so frequently that summer. I think about sitting on the balcony in the sun hearing it blaring from a car on Stoke Newington Church Street. It still makes me smile, it still makes us dance in the kitchen.